Blood testing for vitamin D was until recently an uncommon request and undertaken in a the setting of a research laboratory. In the past few years there is a greatly increasing awareness of the importance vitamin D, and this has been associated with a great increase in blood testing. We can see here experience from the USA, tests funded by Medicade. We are looking at not all blood tests but those concerned with immunology and nutrition. 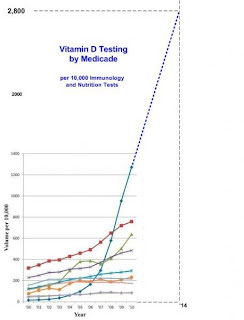 In the year 2000 vitamin D testing was bottom of the list, but since then the increase in number of tests has been enormous. The question is whether this is just a new fad or whether it is of clinical importance. Low blood levels of vitamin D have been linked to a variety of diseases including coronary heart disease, stroke, diabetes, Crohn's disease, rheumatoid arthritis, breast cancer, colon cancer, prostate cancer, multiple sclerosis, and above all early death. It would appear therefore that to identify and correct low blood levels of vitamin D would seem to be sensible, even thought the benefits in the long term are not yet clear. The extent of vitamin D deficiency is far greater than anticipated. It is more common in northern Europe than in southern Europe, similarly in France and the UK. Locations with the lowest levels have the worst health. The majority of people appear to have low levels of vitamin D, especially Asian and Black ethnic minorities in the UK and the USA. It is necessary note that unfortunately there are two units of measurement in use, nanogrammes per ml and nanomols per litre. When you receive your result it is essential to know which of the two measurement unit are being used. 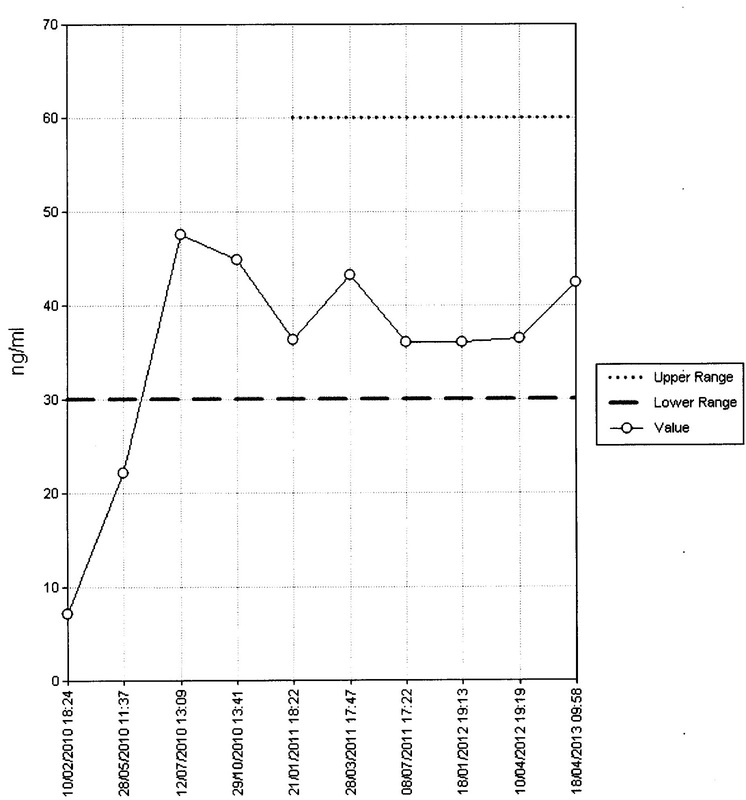 The ideal levels are shown here, but very few people achieve these levels naturally. Most vitamin D comes from the action of the sun on the skin, and few people achieve adequate sun exposure as judged by vitamin D levels in the blood. Air conditioning in hot countries makes this worse on an international scale as industrialisation expands, people spending more times indoors. It is necessary to eat a great deal of fish each day to achieve a good vitamin D level by diet. Sun-bed use leads to good levels of vitamin D and sun-beds used without sunburn are not dangerous to adults. 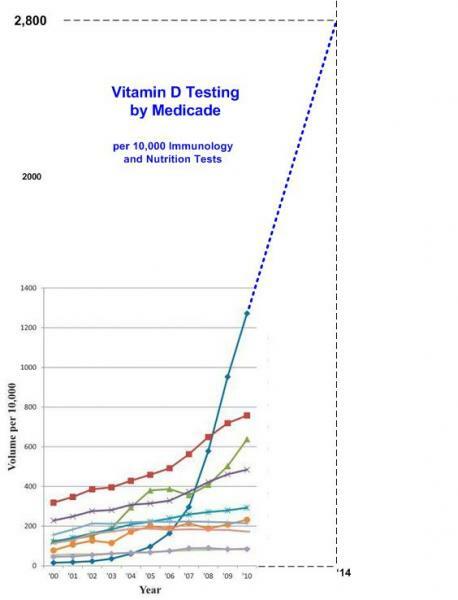 If vitamin D deficiency is so common it could be argued that we should all take a supplement without blood testing. This is safe with a supplement of 2000 units per day. "Overdose" of vitamin D is extremely rare and does not occur if exposure to the sun is good as the sun acting on the sun appears to de-activate circulating vitamin D. It will occur if calcium is given with vitamin D and it is not necessary. 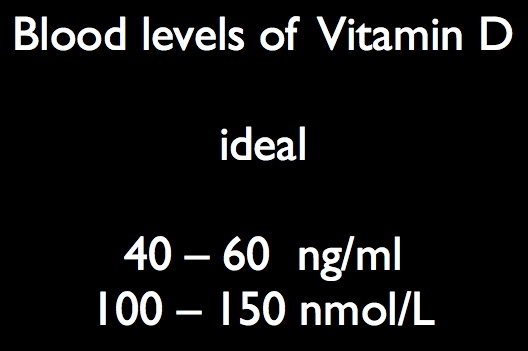 It is reasonable to recheck blood vitamin D level after about 3 months of taking a supplement. Experience now tells us that this is probably not necessary as the response is predictable at stabilisation within the ideal range. We can see that with supplement, in this case 20,000 units each week, the blood level does not keep increasing. It rises into the ideal range and then it stabilises. Vitamin D is consumed by the body, it is utilised and then inactivated. The supplement dose that achieves a steady state is obviously the amount that the body requires each day. We can also see that although multiple measurements were performed on this particular subject, experience now tells us that if the ideal range is achieved after three months that will become the steady state. Although the blood testing of vitamin D is increasing, many people who are at risk of vitamin D deficiency are still not being tested. We can anticipate that the number of tests will increase. Perhaps vitamin D testing should be part of routine testing in early pregnancy, as if a child starts life with a good level of vitamin D, it is likely to continue through life. It appears to be that vitamin D is most important in the early stages of life, particularly before birth and shortly after. 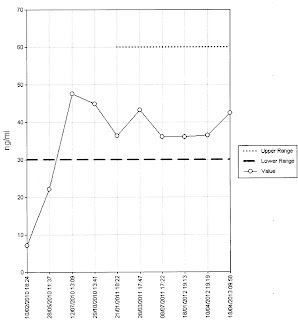 The ideal levels are shown here, but very few people achieve these levels naturally. If vitamin D deficiency is so common it could be argued that we should all take a supplement without blood testing. This is safe with a supplement of 2000 units per day. Hmmm - that rings a bell. Ah yes - substitute "cholesterol" for "vitamin d" and "statins" for "supplement" and we are back on the topic of some of your other recent articles. Ok, perhaps that sounds a little flippant, but the core argument seems to be the same - or to put it the other way, why is the "natural" level not the "ideal" level? Although I am an undoubted cholesterol sceptic I am not against everything. There are some valuable health issues but a lot of work during 30 years has led me to believe that the sun and vitamin D are of great importance. It makes sense with good observational data. The cholesterol story makes no sense and conflicts with observational data. Yes, I am an evangelist for vitamin D but aware of limitations. There is a lot of work being undertaken on vitamin D, but what do we do until the results come through? Vitamin D is at least natural. The level of 2000units per ay was based on a safety study by the EU, not a study of effectiveness. The "natural" level of vitamin D is lower in places that have poor health. The "ideal" level is perhaps that we find in places where population health is much better. If we cannot all go and live in southern European Mediterranean countries, let us try to achieve their levels of vitamin D.
I take 5000 units per day as a soft gel supplement. Not in the longest days when it is sunny as I am out in the garden. (without any sun screen, as a gardener I am out in the sun most days of the year and do not burn as I am constantly exposed). From what you say about my body adjusting its natural levels of vitamin d to a fairly constant level (provided sufficient vit d is available) should I consider reducing my dose to 2000 units a day? I am confident that 5000 units does me no harm. I know the medical establishment is conservative about these things. Do you anticipate in future higher doses will be recommended? No-one knows the best dose of vitamin D to take. 2000units per day is safe as judged by a big study from the EU (electronic content no longer visible). This dose is about right and usually achieves god blood levels. 5000 units per day is OK, but it might be worth having the blood level checked. "Overdosing" on vitamin D is exceptionally rare. It has occurred only with prescription errors (for example 20,000 units per day rather than per week) or when taking calcium with vitamin D. This is not necessary as vitamin D enables absorption of calcium from food. It is not possible to "overdose" on vitamin D from the sun. The body appears to have a self-correcting mechanism whereby excess vitamin D (in its activated form) is inactivated in the skin by the action of the sun. So carry on gardening without sun creams, but protect your head. I think that advice will remain as 2000 – 3000 units per day, or 20,000 units each week. It is outdoor activity that needs to be encouraged.